There were audible groans from the White House press corps this afternoon when Press Secretary Robert Gibbs emerged for his daily briefing in his standard suit and tie. The reason? 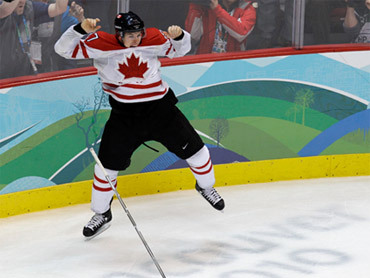 White House spokesman Nick Shapiro had informed reporters that Gibbs had agreed as part of a wager with his Canadian counterpart to wear the Team Canada jersey for the first 15 minutes of an on camera briefing if Canada won the USA/Canada men's gold medal hockey game. Canada won that game in overtime Sunday. Gibbs assured disappointed reporters Monday that his debut in a Team Canada jersey is coming. "We're in the process of getting the hockey sweater…it's on its way, trust me, the Canadians have kept in very close contact for this," he said. Gibbs promised to don the jersey before the week is over and called Sunday's contest a "fabulous game." President Obama and Harper also had a wager on the game. A Canada win meant Mr. Obama had to purchase a case of Molson Canadian for Harper, while a U.S. win would have meant Harper had to buy a case of Yuengling for Mr. Obama. No word on whether Mr. Obama has yet headed out to pick up the case of Molson.